In Britain, during the First World War, 1914 to 1918, queues for food had become dangerously long. A Ministry of Food was created to help with the homefront food situation, and rationing was introduced starting with sugar in December 1917, then with meat and butter in February 1918. The government congratulated itself on its measures, and the Ministry of Food was dissolved on 31 March 1921. In truth, though, it wasn’t a great success: food prices rose by 130%, and the ration coupons were often useless, as the supply of items just wasn’t there to meet even that coupon-limited demand. Britain would do better during the Second World War, 1939 to 1945. The government was always able to honour all ration coupons, and food prices during the war rose by only 20%. The British population emerged healthier than it had ever been before, and families had been educated in putting nutritional, frugal meals on their tables. In many ways, it was home economics that would win the war. In the 1930s, before the outbreak of the Second World War, the British population was somewhere between 46 million and 52 million. Britain imported 70% of its food; this required 20 million tons of shipping a year. 50% of meat was imported, 70% of cheese and sugar, 80% of fruits, 70% of cereals and fats, 91% of butter. Of this, 1/6th of meat imports, 1/4 of butter imports and 1/2 of cheese imports came from New Zealand alone, a long ways away by shipping lanes. Knowing this would lead the Axis powers into hoping to starve the British population into submission, by cutting off those food supply lines. The British government began planning for wartime rationing in 1936. Should war occur again, this time they hoped to be better prepared based on their experiences the last time around. A Food (Defence Plans) Department was set up as part of the Board of Trade to do the project planning. Ration booklets were printed up in 1938, ready to go. Britain declared war on Germany on 3 September 1939.
at a mobile field kitchen in Sussex 1941. On the 4th September 1939, the Ministry of Food was reconstituted, with William Morrison as the Minister. On 3 April 1940, Neville Chamberlain replaced Morrison with Frederick Marquis, Baron Woolton. Marquis (his real last name) had been a former social worker and former managing director of the Lewis store chain in Northern England. He had proven experience in communicating with consumers, and had been awarded a peerage in 1939 before the war for his contributions to British industry. He had not been involved in politics or government previously. 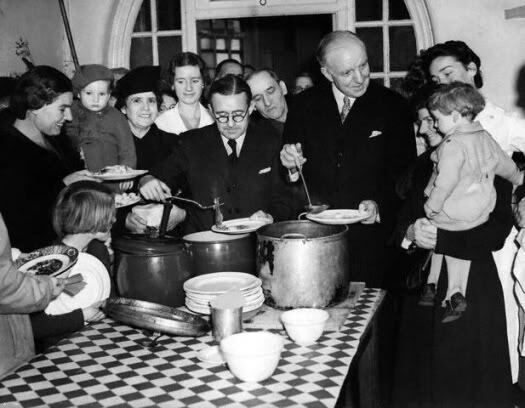 He would remain Minister of Food until December 1943, at which time Churchill transferred him to the Ministry of Reconstruction to start planning to rebuild Britain after the war. Woolton decided that it wasn’t enough to just ration food or limit what people ate; he set the Ministry the goals of treating the British public as consumers, and explaining nutrition to them in simple terms so that they could get the most nutrition out of the available food despite the rations. Previously, before the war, the British government had been infiltrated by the thinking of Home Economists. Consequently, it was widely accepted by government in the UK that there was a strong link between diet, and a healthy population. Woolton’s chief scientific advisor was Jack Drummond, who worked closely with Wilson Jameson, British Chief Medical Officer from 1940 to 1950. Their methods of communicating would prove to be effective: by the end of the war, housewives had become very educated in nutritional vocabulary. The Ministry issued many cooking leaflets, often dedicated to specific topics such as the magic of carrots. The language used was practical, and realistic for the time — in listing ingredients for suggested recipes, the government leaflets would often say beside an ingredient such as butter: “if possible.” Cooking demonstrations by women such as Marguerite Patten (see separate entry) were held in many stores, including Harrods. Educational short movies on cooking were made for showing at cinemas; BBC Radio ran a morning radio programme called “Kitchen Front”, broadcast from studios in Oxford Street, London, hosted by Stuart Petre Brodie and featuring guests such as Marguerite. 15,000 people eventually worked for the Ministry of Food. There were 18 Food Officers in Great Britain, and 1 in Northern Ireland; 1,500 Food Control Committees (with consumer and retailer representatives on them), and 1,300 Local Food Offices, who distributed ration books and licenced shopkeepers to handle them. The Ministry of Food also created secret food depot warehouses throughout the country in which it stockpiled food in the event of invasion. This was unknown to the wider population. The already-printed ration booklets were issued to the public on 8 September 1939, 5 days after war was declared. They were not actually used until four months later, however. Bringing rationing into effect was postponed several times owing to a campaign in the press led by the Daily Express newspaper, which called rationing an unnecessary folly and government interference with civil liberties. The government finally overcame political resistance and rationing came into effect on 8 January 1940. It’s important to note that the food coupons in Ration Booklets didn’t entitle you to, say, butter, for free. Instead, they entitled you to purchase a certain amount of butter — you still had to come up with the money. A ration book was issued to each person and each child. The public went to their local designated Ministry of Food offices to collect their ration books. A responsible person in the household could pick up and sign for the ration booklets for everyone in the household. New ration books were issued about once a year. To replace a lost booklet, you had to sign a declaration, and pay a 1 shilling fee. You had to register at a store that you wished to use the coupons at, and could only use them there. There was no shopping around for those items. At first, you had to use the coupons during the week indicated for those particular coupons being valid. Later, you could save them up a bit: bacon/ham for two weeks, other items for 4 weeks. There actually was some flexibility in the system for special dietary needs: special ration books were issued for vegetarians, for those with religious dietary restrictions (Muslim and Jewish), people with special health needs, those engaged in hard physical labour, people from poorer backgrounds, etc. Vegetarians, Jews and Muslims, for instance, were allowed to use their ham or bacon allowance on cheese instead. Jews could get kosher meat. An important functional principle was that, unlike during the First World War, the government applied rationing only to items that it could be sure of people being able to get always. The goal was to ensure that the consumer’s ration entitlement would always be honoured. A ration coupon was your guarantee that you would get your share of something, however small the shares were. Rationing wasn’t applied to seasonal items — say, summer fruit such as berries, as the government couldn’t guarantee, clearly, their year-round supply. Information, Overseas Picture Division. April 1943. Fresh oranges got through occasionally from America — but consumption of them was restricted to children only. Points rationing was introduced 1 December 1941 via a separate pink ration book. It ran in conjunction with regular coupon rationing, but was more flexible than coupon rationing. A butter coupon would entitle you to purchase x amount of butter that week. But if you didn’t use it on butter, that was that: you couldn’t use it on anything else, and you couldn’t carry it forward; they were valid only for that four week period. The points rations gave shoppers greater choice than the ration coupons did, putting them more in control of their shopping. You got a certain number of points to use on any of the items, in any combination you wished, that were covered under points rations. (Again, you still had to cough up the cash for the actual purchase.) And, you could do the purchases anywhere, not just at the grocer you registered at for the coupon usage. The first items to go on points rationing were tinned meats, tinned fish and tinned beans; later, points rationing was applied to most tinned goods, dried fruits, cereals, legumes, biscuits, etc. When points rationing was first introduced, everyone had 16 points per every four weeks. Later that was raised to 24 points, then on 27 May 1945 reduced downward again, to 20 points. The Ministry of Food could adjust upwards or downwards the number of points that a food item would cost, depending on the supply of it at the time in the nation’s food chain. Housewives would watch the newspapers to monitor news on the “Changes in Points Value” columns, to see if anything they wanted had become cheaper (or more expensive) in points. For instance, upon the introduction of points rationing, a one-pound tin of canned salmon or of canned sausage meat from America originally required 16 points. People weren’t trying the American canned sausage meat, so the Ministry of Food raised the points requirement for the salmon to 24 points, and reduced the points required for the canned sausage meat to 8 points to encourage people to try it. The sausage meat in question was Spam; the British public eventually came round to it. Once the ration booklets were received for that year, you would take them and register them at the grocery stores you intended to use them at. Note the plural, stores. This was before the days of supermarkets. You went to different stores for different items: the greengrocer, the butcher, the baker, the fishmonger, etc. You would register at one store for meat, another for dry goods, etc. Sometimes, a grocer would sell more than one of the rationed items, and you could register for purchasing both there, if you wished. Shoppers would debate whether it was best to spread their registration slots around to different stores, in the hopes of spotting more items suddenly appearing for sale, or to concentrate them all at one store, in hopes of gaining favoured customer status for special items held back under the shop counter. New ration books were issued about once a year. That was a good time to change who you were registered with, if you wanted to. You could change at other times, if you wished, but it was tricky to do so without offending a shop keeper that you might later need to return to or want favours from later. Shopkeepers got just enough food for the customers they had registered with them. Stores were encouraged to form Traders’ Mutual Aid Pacts, to allow each other to temporarily take over looking after a store’s registered customers if that store were bombed out. A family member could go to the store with all the ration books for that family (in practice, it was usually the mother.) You showed the shop keeper your coupons that allowed you to make the purchases. If they were regular ration coupons, the shop keeper then cancelled them in the booklet with a stamp. If you were using points coupons, they were cut out. Then, you passed over the money for that purchase. If you had used up all the coupons for an item for that week, or points for that 4 week period, then that was that until the next time period. No amount of money could get you the items in question. 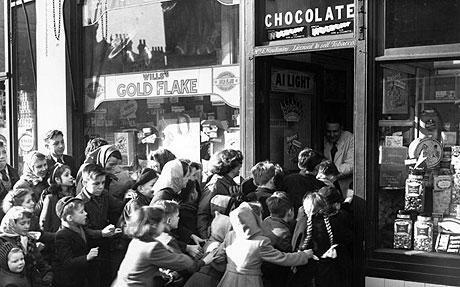 Even if you didn’t want your rations or need all of a particular rationed item that you were entitled to, most people bought them anyway, and sold them, usually at cost, or traded them, to friends or neighbours who would want them. 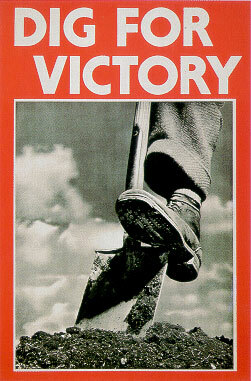 The Ministry of Food launched its ‘Dig for Victory’ campaign in October 1939, one month after war broke out. The campaign was led by an agricultural economist, Professor John Raeburn, who was recruited to the Ministry of Food in 1939, and who would run the campaign until the end of the war. The campaign encouraged people to transform their front and back gardens into vegetable plots. The goal was to replace imported food, thus freeing up shipping space for more valuable war materials, and to make up for food that was sunk in transit. By the end of 1940, 728,000 tons of food making its way to Britain had been lost, sunk by German submarine activity. In 1940, millions of commercially-farmed hens had to be killed and sold off as food, as there was a shortage of stuff to feed them. This led to an egg shortage, and egg rationing of 1 egg per person a week. Expectant mothers and vegetarians were allowed two eggs a week. US Office of War Information, Overseas Picture Division. April 1943. Communities set up neighbourhood Pig Clubs, to buy a pig, then feed it scraps from the households involved. (In many towns, the councils put food waste bins in the streets: if you weren’t part of a Pig Club, in there went peelings and scraps to be sent to farms to feed pigs.) If you belonged to a Pig Club, that was registered, and you had to give up your meat coupons. If you kept a private pig, you had to register the pig, because half was supposed to go to the government, but not everyone registered their pigs. Rabbit keeping also became popular. They provided a ready source of meat, as they breed year round, and you could even sell the rabbit skin to be used for boots, coats, etc. In 1941, the Americans sent 9 tons of vegetable seeds over through the British War Relief Society for the British public to use in their home gardens. Most vegetables were not rationed; cauliflower became a staple vegetable at meals. Granted, keeping vegetable gardens and animals was easier for people living outside the big cities, so in response, the Ministry requisitioned green spaces in cities, even some parks such as the Royal Park, Kensington Gardens, and divvied the land out to households in parcels known as “allotments”, a small space where you could go and set up your own vegetable patch (and hope that a stray bomb didn’t find its way there right at the start of harvest season.) Commercial fertilizers for gardens had of course disappeared at the start of the war, so whenever a delivery cart and horse, or a police horse, happened to pass by a house, mothers would send many a humiliated child out to the road with a bucket and shovel in the hopes that the passing horse had left a calling card in the form of some manure. During the war, daylight savings was put ahead by two hours every year in March, to allow more daylight hours for farming, and gardening after work. Overall, the campaign was a massive success: by 1943, it was estimated that home gardens were producing over one million tons of produce, and by 1945, around 75% of food consumed in Britain was produced in Britain. The campaign was still kept up after the war, in order to free up food to feed the starving populations of Europe. A Women’s Land Army (WLA) had been created in the First World War to help farmers and market gardeners by replacing the agricultural workers who had gone into the armed forces with women. The goal was to ensure that homefront agricultural food production was maintained. It was disbanded at the end of that war. The Land Army was reconstituted in June of 1939, 3 months before the Second World War broke out, by the Ministry of Agriculture and Fisheries, with Lady Denman being the honorary head. It was volunteer at first; some women worked part-time, seasonally as needed. Later, conscription of girls over 16 was used to bolster the ranks. A third of the women came from cities; the other two-thirds came from the countryside. The work was 48 hours a week in the winter; 50 to 54 hours a week in the summer. They got a uniform consisting of a green tie and jumper (aka pullover sweater), and a brown hat, and extra rations, but were paid about 20% less than the male workers they replaced. Some lived with the farming families; on larger farms, some were given accommodation in special cabins built for them. Some were placed near to where they lived, so returned home each day. The women were often moved from farm to farm, depending on where they were needed when. 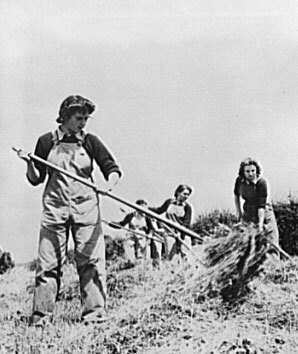 By 1944, there were over 80,000 women in the British Women’s Land Army. The Land Army was disbanded on 21 October 1950. Women who participated felt that they never really got much recognition; a ceremony was finally held in June 2008 in which then Prime Minister Gordon Brown presented badges to some of the veterans still living at the time. These were the days before refrigeration and freezing was common in household kitchens (and not just Britain — the refrigerator revolution did not sweep America until the late 1940s), so housewives still knew and used preservation techniques such as canning. The Ministry of Food educated people with leaflets, radio programmes and community demonstrations on the latest and greatest food preserving techniques, to ensure that no food went to waste. Eggs could be kept fresher for a bit longer by rubbing them with lard to seal the pores, or for longer periods, by storing them in crocks under water with isinglass or waterglass mixed in, or by turning them into pickled eggs. Canadian Women’s Institutes supported their sister British Women’s Institutes, by donating to them useful tools such as canning machines, etc, which could be shared out. Preserving of fruits and vegetables was largely done in Kilner jars: glass jars with glass lids with a spring on them. You put a rubber ring around the neck of each jar before sealing it. You replaced the rubber rings each season. The Ministry of Food also advised people on how to cure and preserve meat. Pork or lamp chops could be preserved for up to six weeks by first cooking them, and then putting them in a crock completely covered with fat. Carrots were particularly promoted to the population, as there was no shortage of them, and they were deemed very healthy. The Ministry of Food suggested Carrolade (a homemade juice blend from mixed carrot and Swede juices), carrot jam, curried carrots, etc. For use in the Ministry’s promotional efforts, a carrot family was invented for them on the other side of the Atlantic by Hank Porter, a Disney cartoonist: members of the family included Carroty George, Clara Carrot, and Dr Carrot (the Ministry of Food transformed him into Pop Carrot, as they already had their own Dr Carrot figure.) The drawings were wire-photoed to London, courtesy of RCA. The characters were used in newspaper campaigns, recipe booklets, posters and flyers. Marguerite Patten later said she remembered that you wouldn’t peel carrots; to reduce wastage, you’d wash them instead and leave the skin on, and cut the tops off as thinly as you possibly could. The Ministry of Food also created a Potato Pete character. The character acquired his own song, recorded by a woman named Betty Driver, later to become famous for portraying Betty Williams in Coronation Street, who in turn would become famous for her potato dish, Lancashire Hotpot. The Ministry recommended scrubbing potatoes clean instead of peeling them, as peeling caused wastage, however small. One of the most famous dishes invented during the war was Woolton Pie, for the purpose of promoting root vegetables in general. It was created by Francois Latry (1919-1942), the chef at the Savoy Hotel in London, and named in honour of the Minister of Food himself. The pie consists of carrots, turnips, parsnips and potatoes simmered in an oatmeal stock, then turned into a baking dish, topped with a crust of dough, or mashed potato, and baked. Sadly, despite all the promotion that the recipe was launched with, the dish never really took off in popularity amongst the public. The Ministry of Food actually invented several food products, and legislated their production to substitute for other goods. All were a success in terms of keeping the population healthy and fed. Sadly, not all were a success in terms of endearing themselves to the tastebuds of the population. White flour was banned for the most part for household use [Ed: it was still allowed commercially in the production of some biscuits, etc. ], being replaced by a National Flour, with “wheatmeal” being the official name invented for it. While not quite wholewheat flour (in order to be a bit of a compromise), it left all the bran in it. It was greyish in colour. Some women in desperation would sieve it through their nylon stockings to get white flour; if you kept chickens, the bran sieved out could go to make a ration-free mash for the chickens. Bakers were obliged to use the National Flour to make only one type of bread, which was called the National Loaf. Nutritionists praised the composition of the bread (and fought for it to be the only legal bread after the war); the population however dubbed it “Hitler’s Secret Weapon” because they disliked it so much. [Ed: for more information on this bread and National Flour, see the separate entry on National Loaf.] However, it was a success: the government was able to keep the supply plentiful enough that bread was never rationed during the entire war. From July 1942 onwards, there was National Dried Egg, courtesy of America. One packet of the powdered, dried egg was the equivalent of one dozen eggs. Meat, of course, did not escape rationing, and in fact, was the last thing to come off the ration list, in 1954. First of all, some “meats” were not rationed. For those who wanted it, horse meat was not rationed (housewives resisted buying beef on the black market, as you couldn’t be sure you weren’t ending up with horse after all.) Offal and sausages were only rationed from 1942 to 1944. But offal was still scarce (for the few that wanted it at any price), and the sausages had little meat in them, and much filler. The Ministry of Food passed a regulation that sausages had to contain at least 10% meat. Meat pies were not rationed, though the meat in them was likely to be Spam. Spam from America was plentiful, and came to be seen as a godsend. Spam for meals would be fried in a frying pan, or battered and fried in oil with chips. Fish was not rationed, partly because the Ministry of Food couldn’t find an effective way to ration it, given the underlying principle they followed that rationed items would only be those of which they could guarantee constant supply, and supply was governed by the natural scarcity of how many fishermen were willing to put out to sea with submarines lurking under them at any given time. Consequently, there were always very long queues outside fishmongers. Tinned Snoek, a type of fish from South Africa [Ed: Thyrsites atun], became widely and easily available off-ration from January 1945 onwards, but was not popular owing to it being very oily, extremely bony, and having a taste that people just couldn’t place. At the same time, the Ministry of Food made whale meat available off-ration as well, and encouraged people to eat it, releasing recipes, etc. But housewives complained that they just couldn’t get the taste out of it, even after soaking it overnight in vinegar, and boiling it all day. A large tin of sausage meat from America [Ed: we’re uncertain at this point which. Perhaps Wilson’s Mor.) proved to be popular. It required a lot of points to be allowed to buy it, 16, but the tin was large enough for several meals, and had on top of the sausage meat nearly 1/2 pound of fat, which was really useful as a cooking fat. There was a National Butter and two types of National Margarine. Before the war, a middle-class British household tended to put butter on the table, and reserve margarine for cooking purposes. But because the rations for the margarines were more generous than for the butter, margarine worked its way out of the kitchen and into the dining room. People were inventive in how they boosted the supply of proper butter at home. Some people recalled that you’d do things like sweet talk the women at work canteens to put lots of butter on a scone, and then not eat it, but bring it home and scrape off the butter for use at home. Many would use beef dripping as a spread on their bread in place of butter or margarine. Canadian Red Cross parcels for Canadian, British and Allied prisoners of war were preferred over British or American parcels because the Canadian parcels always included tins of proper butter; the British or American parcels had margarine instead 70% of the time. of War Information, Overseas Picture Division. Fish and chips were not rationed. Consequently, fish and chips, which before the war had been seen as just a working-class food, made its way upward to become a food that all Britons ate. Your local chippie could also sell you meat pies, as they were not rationed, either — though the meat in them was more likely to be Spam than anything else. A convoy of mobile canteens would move into bombed areas to feed residents and rescue workers for free, coordinated by the Ministry of Food. These mobile canteens were largely funded by donations from America. The Ministry expected rationed home food to be supplemented by meals at work and at school. Before the war, only about 250,000 school meals a day were served; by the end of the war, school meals happened just about everywhere, feeding about 1,850,000 children a day. The Ministry made it compulsory for any factory over a certain size to open a canteen to feed its workers. The number of factory canteens consequently went from 1,500 in 1939 to 18,500 in 1945. In July 1940, restaurant restrictions started coming into effect. The first regulation was that in one meal you could not have both a meat and fish dish. So a fish starter, and meat main course, was out. In June 1942, two additional restaurant restrictions came into effect. The first was that no restaurant meal could have more than three courses. The second was that no restaurant could charge more than 5 shillings for a meal (alcohol and coffee excluded.) This had the desired effect, of course, of causing restaurants to be more frugal in what they chose to offer, or serve smaller portions of it, so that they could still make a profit on the meal. To ensure that restaurants didn’t just try to get around this through “cover charges”, the restriction also stipulated that the highest cover charge that would be allowed was 7s. 6d. “You need no ration card for restaurants, although a waiter will serve only one meal to a person at a sitting, and that limited to three courses or five shillings expenditure. Swanky places get around the quality barrier by adding a stiff cover charge, but the three courses are never exceeded. A soup or hors d’oeuvres, an entree and a dessert are regulation. Coffee and drinks are extra. The maitre d’hotel or waiter may “save” a portion of joint for old customers, but a late diner will inevitably find the menu exhausted and only sausage or mushrooms available.” — Albin E. Johnson. Europe: Where the Cupboard is Almost Bare. Rotary International: The Rotarian. September 1943. Vol. 63, No. 3. Page 18. Public eating centres called “British Restaurants” were set up across the country. The driving force behind their creation was a Mrs Flora Solomon, who was in charge of Marks & Spencer’s staff canteens at the beginning of the war. She was inspired by seeing the Londoners’ Meals Service, which London County Council started in September 1940 to feed those who had been bombed out of their homes. She gave the idea to Lord Woolton, whom she knew socially. He backed the idea, and asked her to get it started. She got permission from Simon Marks, one of the owners of Marks & Spencer, to use some of her work hours towards the setup. She set up the first “Communal Feeding Centre”, as she called it, in the Kensington area of London, using Marks & Spencer’s store personnel as staff, then set up one in Coventry after the blitz bombing it suffered on 14 November 1940. The Marks & Sparks store in Coventry had been bombed out; since the staff had nowhere to work, she pressed them into service for her Feed Centre there, as well. Her plan was that once the Communal Centres were up and running, they would be turned over to locals in the area to run. One opened in Newcastle on 6 October 1941, with the Duchess of Northumberland and the Lord Mayor of Newcastle having lunch on the first day to help promote it. The menu there in 1941 was Soup 2d (1p); Meat with 2 Veg 7d (3p); Sweet 2d (1p); Cup of Tea 1d (½p). Churchill liked the idea very much, but he didn’t approve of the name. He thought it smacked of socialism, and suggested “British Restaurants” instead, and so, as of January 1942, “British Restaurants” they were. All meals were ration free. The only rule was that you could only have one serving of either meat, game, poultry, fish, eggs, or cheese. You couldn’t have two from that list at the same meal. They were also relatively inexpensive. The set maximum price allowed was 9d, though even that would likely only have been charged in London where operating costs would be higher. The British Restaurants served basic foods such as sausage, mash, gravy, or minced beef with parsnips, greens and potatoes. There was also pudding and custard. Some of the British Restaurants supplied packed meals for working people such as miners. The British restaurant in Chopwell (in what is now Tyne and Wear County; previously Durham) advertised the following food to go: meat pies, sausage rolls or spam sandwiches at 4d each; ham or bacon sandwich at 5d; teacakes with butter and jam on them, 3d. By November 1943, there were 2,145 British Restaurants. Less populous areas had Food Distribution Centres, popularly called “Cash and Carry Restaurants”; they were supplied by a British Restaurant in a larger area. Any food waste from the restaurants went to local pig clubs. The government was not simply concerned that people had basic quantities of basic foods: they also considered the overall population health as understood at the time to be vital to the war effort. Doctors regularly visited schools to check the nutrition and health status of children. Schools dosed students up weekly with Virol, a bone-marrow laxative tonic sweetened with malt, to keep them regular. School meals became free for poorer children. Children under five got cod liver oil; those under three got daily milk (fluid or full-cream from dried), and orange juice as well. Mothers picked up the bottles of cod liver oil and concentrated orange juice (both provided by America) at clinics called “Welfare Centres” that were set up. Though candies were rationed, cough drops were not — not many children, however, liked cough drops enough that they considered them to be considered an acceptable substitute for candy. Every national food product that the government created, and every suggested recipe released, was gone over with a fine tooth comb by dieticians, nutritionists and Home Economists. The one unhealthy thing about the war time food, by today’s standards at least, was the amount of salt prevalent. Salt was unrationed, so it was used freely to try to give some interest to the monotony of the admittedly plain-tasting food. The result of these efforts was that, despite the deprivation, the British population actually ended the war tremendously fit and healthy: healthier than they had been before, or have been since. Children in general were even taller and heavier than those before the war. Infant mortality rates went down; average age of death from natural causes increased, meaning civilians just plain lived longer. Interestingly, the war-time precaution of night-time blackouts caused the number of people killed by night-time road accidents to double over pre-war figures, even though there were fewer journeys by car owing to petrol rationing. Kitchens in wartime Britain were much as they had been in the 1930s before the war. Most kitchens had gas stoves. Coal-burning boilers provided hot water for both kitchen use and heating the home through radiators. Hot water from the tap was used carefully, though, because the coal used to heat it was rationed. Most homes did not have refrigerators yet [Ed: nor were they common yet in North America], so canning was still a skill practised at home to preserve food, and there was a lot of shopping daily to pick up fresh produce. A ‘Saucepans for Spitfires’ campaign claimed much of the aluminum cookware in kitchens. It later emerged that the government didn’t actually need this aluminum; it was more of a morale booster to let people feel that they were helping. Those people with relatives and friends abroad were fortunate, because food packages from them to help bolster or brighten kitchen pantries got through surprisingly often. It was illegal to feed human food to pets, even bread to birds. Bread wasted – Miss Mary Bridget O’Sullivan was fined a total of ten pounds, with costs, for permitting bread to be wasted. It was stated that her servant was twice seen throwing bread to birds in the garden, and when Miss O’Sullivan was interviewed she admitted that bread was put out every day. “I cannot see the birds starve”, she said.” — Bristol Evening Post. 20 January 1943. Shortage of one item particularly exasperated house-wives: onions. Onions disappeared from the shelves of greengrocers early in the war. Previously, they had been imported so cheaply from Bermuda, Brittany, and the Channel Islands that they weren’t being grown in large quantities in Britain. Onions became so rare that they would be prizes for raffles and contests. In February 1941, the staff at The Times of London newspaper held a raffle for a one-and-a-half pound onion, which raised £4 3s 4d . “Served as a side dish at our luncheon of the regular three-course meal, which Englishmen religiously impose upon themselves in conformity with ration regulations, was a medium-size boiled Spanish onion. “You’ve been robbing a bank or playing with the black market,” exclaimed the astonished husband. “Neither,” explained his proud wife. “Michael (her son and an officer on a destroyer guarding trans-Atlantic convoys) brought these from Bermuda on his last trip and I’ve been saving them for just such an occasion.” — Albin E. Johnson. Europe: Where the Cupboard is Almost Bare. Rotary International: The Rotarian. September 1943. Vol. 63, No. 3. Page 16. Rationing allowances fluctuated during the war. 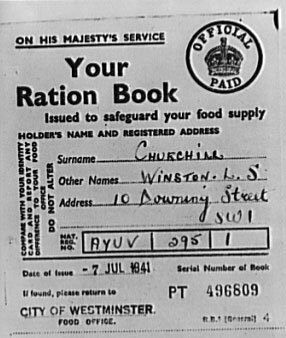 Note that rationing continued in Britain for nine years after the end of the war. The reason given was to help free up food to feed the starving European populations. 1951 – Churchill campaigned on finally abolishing government wartime controls such as rationing, and ID cards, with his “Set the people free” campaign. In doing so, he was able to channel the frustration of women in particular into an election victory for him over the previous Labour government. 1954 – July 4: All remaining rationing is abolished. “Lord Woolton Pie: The Official Recipe. In hotels and restaurants, no less than in communal canteens, many people have tasted Lord Woolton pie and pronounced it good. Like many another economical dish, it can be described as wholesome fare. It also meets the dietician’s requirements in certain vitamins. The ingredients can be varied according to the vegetables in season. Here is the official recipe: — Take 1 lb. each diced of potatoes, cauliflower, swedes, and carrots, three or four spring onions – if possible, one teaspoonful of vegetable extract, and one tablespoonful of oatmeal. Cook all together for 10 minutes with just enough water to cover. Stir occasionally to prevent the mixture from sticking. Allow to cool; put into a pie dish, sprinkle with chopped parsley, and cover with a crust of potato or wheatmeal pastry. Bake in a moderate oven until the pastry is nicely browned and serve hot with a brown gravy.” — London: The Times. 26 April 1941. “Carrot Sandwich Fillings: Add two parts of grated raw carrot to one part of finely shredded white heart cabbage and bind with chutney or sweet pickle. Pepper and salt to taste. OR Bind some grated raw carrot with mustard sauce flavoured with a dash of vinegar.” — Ministry of Food, War Cookery Leaflet 4. “The number of rabbits we ate shot up, as did pigeons, and like a lot of well-connected people, the family I worked for fiddled the system shamelessly. You see they thought they had been born with an entitlement to a certain standard of living and they really thought that poorer people were better equipped to live on less — even during the war. I don’t think there was any nastiness in it. They just assumed we had always lived on a few scraps of bacon and lots of spuds and that therefore war shortages weren’t so hard for us to bear, whereas for them no butter was a matter of life and death… But about halfway through, in 1943 I think, the house changed. We’d had pretty poor rations like everyone else and then her Ladyship told me one morning that she had organized food deliveries from a relative. This sounded very odd to me. Apart from anything else it was extraordinary for an upper-class woman to admit that she had relatives in trade. I didn’t believe a word of it, especially as it was always the duty of the cook to order all the food. And there was something about her face that wasn’t quite right when she told me….. Then the penny dropped. It was all black market stuff. The meat and eggs and butter were all delivered by a man I’d never seen before and there were never any bills — or at least none that came to me. He would just drop everything on the big kitchen table and leave without saying a word. The amounts were pre-war quantities — huge joints, and butter by the pound….. I was told by her Ladyship by a note rather than in person that the servants’ meals should continue to reflect the ‘current rationing situation.’ In other words the mean old devil wanted me to continue to cook spuds and cabbage for the other servants while the family enjoyed all the black-market stuff. Well, I’m afraid I took very little notice of that I can tell you.” — Jackman, Nancy. With Tom Quinn. The Cook’s Tale. London: Hodder & Stoughton. 2012. Page 191 – 194. Lord Woolton: We have told traders who buy margarine that they must take it, not from where they want to get it, but from the nearest factory that is making it. We have prescribed the places from which the retailer can get his goods because we have got what is, substantially, a standard margarine all over the country, and it is just as good from one place as from another. We called together the bread people. We have arranged that the deliveries of bread shall be zoned, so that people do not go crossing unnecessarily the routes of others. We have been to the millers. We have told the millers that instead of delivering flour as they have been accustomed, according to the places where they had their clients, flour must in future be delivered from the mill that is nearest to the bakery. I recently have come to an agreement — the noble Earl, Lord De La Warr, suggested this method, which is one we are practising—with the cake and biscuit people. I asked them to meet me. I told them we no longer could afford, as I have told all these people, the amount of transport and man-power involved in this extravagant system of distribution, and that questions of their own good will just had to go by the board for the period of the war. The result of that is that 300,000 retailers have been reshuffled among the cake and biscuit manufacturers in this country so that they now draw their supplies from the places which are nearest. We have saved 12,000,000 ton-miles of transport, a matter of 40 per cent. of the transport of these trades. We have done the same thing with the bacon trade. Seventy-four per cent. of the bacon that is in the shops in this country now travels less than twenty-five miles in order to get there instead of going all over the country. We have done the same with sugar, where we have saved 10,000,000 ton-miles as a result. By these processes—and this will become obvious in a few weeks—we are restricting the choice of the public. They will no longer be able to say that they must have the product of the firm X because they prefer it to the product of the firm Y. Sweets we have restricted into various areas, only one firm supplying the same commodity in that district. We have saved 10,000,000 ton-miles as a result, and 500,000 gallons of petrol. If I may mention beer, we are going to save 1,128,000 gallons of petrol next year, as compared with 1939, as a result of the reorganization of deliveries in the beer trade. This year we are going to determine where tomatoes shall go to. I hope that plan is going to receive the support of the market gardeners and the agricultural interests generally, because this certainly is true, that whilst your Lordships may on occasion urge me to take a more vigorous line, I do not always find when I have taken that vigorous line that I have got the unanimous support of the agricultural interests behind me. I made a conscientious effort, supported by the voluntary services of some very good citizens in this country, to deal with carrots and onions, but I do not think it met with a great deal of approval in spite of the effort and knowledge which went into it. One more thing will be announced tomorrow. I am trying to get some orderly arrangement whereby retailers will only be allowed to draw their goods from wholesalers in certain areas. This means some restriction on the free choice of the retailer, but the restriction mainly is concerned with the goods that are already goods coming under control of the Minister of Food and in respect of which we prescribe prices. That scheme, which will divide the country up into a number of sectors and which will prevent all that overlapping that takes place in transport, will save a great deal of money, a great deal of labour—and that is more important than money in these days—and it will save a great deal of petrol.” — Frederick Marquis, Lord Woolton, speaking in the House of Lords. FOODSTUFFS: COST OF DISTRIBUTION. HL Deb 03 June 1942 vol 123 page 103 – 105. Bread was never rationed in Britain during the war, though ironically it was for a short period after the war, from 21 July 1946 to July 1948. Some feel that the reason Prime Minister Attlee’s government introduced bread rationing was more political than out of actual necessity. Britain wanted two things from America: (a) That America should take over feeding refugees in the British occupied zone of Germany; (b) reconstruction loans and Marshall Plan aid. To this end, Britain needed, frankly, to look needy, even though it had a guaranteed wheat supply from Canada. Bread rationing ended in 1948 shortly after a signed and sealed agreement on Marshall Plan aid was safely in British hands. The complete story is covered by Ina Zweiniger-Bargielowska in her “Bread Rationing in Britain, July 1946 – July 1948” in the journal “Twentieth Century British History” (Vol 4, No 1 1993. pp. 57 – 85). Virol was made by the Bovril company; production stopped sometime during the war as it became too costly to make. BBC. Wartime Garden and Kitchen. With Harry Dodson, Ruth Mott, et al. Episode 6. 1993. Start time: 16:20. Coren, Giles. Dinner? It was historic. London: The Times. 15 May 2008. Gilbert, Gerard. A taste of austerity: Can chef Valentine Warner conjure a feast from wartime food rations? London: The Independent. 14 January 2010. Heick, W.H. A propensity to protect: butter, margarine and the rise of urban culture in Canada. Waterloo, Ontario: Wilfrid Laurier University Press. 1991. Page 60. Johnson, Albin E. Europe: Where the Cupboard is Almost Bare. Rotary International: The Rotarian. September 1943. Vol. 63, No. 3. pp 16 – 19. Jones, Sir Francis Avery. New Concepts in Human Nutrition in the Twentieth Century: The Special role of micronutrients. The Caroline Walker Lecture 1992. Abbots Langley, Hertfordshire, England: The Caroline Walker Trust. Pages 13 – 14. Lloyd, E.M.H. Some Notes on Points Rationing. In: The Review of Economic Statistics. May 1942. Volume XXIV, # 2. Page 49 – 52. Longmate, Norman. The Kitchen. In “How we Lived Then – A history of everyday life during the Second World War. Random House. 1971. Zweiniger-Bargielowska, Ina. Austerity in Britain: Rationing, Controls, and Consumption 1939-1955. Oxford and New York: Oxford University Press, 2000.